Well they keep tabs on every other kind of alien ,might as well govern the ETs too . I'm sure the president of the USA gets the same folders . Just like any other immigrant . Lol. I bet some famous people are ETs ,and everyone goes ,THEM !?!? SERIOUSLY !?!?! when they find out . If we even find evidence of microbial life on other planets in our time we'll be lucky. Anything within our solar system most likely from the same origin. If anyone proves me wrong I'll be pleasantly surprised. Edit: As for OP: Dimitry & Julia Gillard seem like good friends. What? We already discussed this.. This entire thing was a joke from the website that originally posted it. More detailed information on this topic you can get from a well-known movie called Men In Black... I will not tell you how many of them are among us because it may cause panic,"
"Along with the briefcase with nuclear codes, the president of the country is given a special 'top secret' folder. This folder in its entirety contains information about aliens who visited our planet. Along with this, you are given a report of the absolutely secret special service that exercises control over aliens on the territory of our country..."
It's very encouraging that the Russia PM is becoming more forthcoming about what has obviously been covered-up by the United States. ET-tech IMO should be shared by all people of the planet Earth. We are one people one planet. And what will happen if the governments of the world admit that there are extra terrestrials living among us? Arizona will pass legislation banning them from seeking employment and health care. Ohh, I see, they are all in on it, but the US is covering everyone up. Is that why they call Santa Father Frost? The US is covering Santa up, and ridiculing the claims, so in a political move, the Russians changed the name so the could release the information and not break any contractual agreements? Its very interesting information to ponder at. I swear it's like I'm speaking to a brick wall here. This topic was already discussed a few days ago. We already proved this was a complete and total joke. Not quite sure why everyone is still thinking there is some reality here?! I want to see an alien or even a hybrid. I want to tell them to make themselves known to humanity or else leave the planet. Keeping secrets is very sinister, whether it is government or other beings and I for one am sick and tired of these stupid guessing games and speculations. I want proof on whether other species exist or what they are up to. The government should take into consideration that the role they are elected for is to support the public, but unfortunately even if they tell the truth now we would still think they are lying for their own selfish reasons. I for one am tired of all this conspiracy stuff. At least someone of authority is admitting it now. This thread makes me laugh. 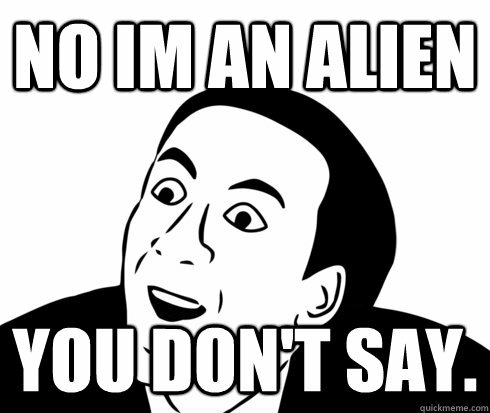 One world leader says there is no aliens, and the conspiracy crowed gets up in arms how he's lying. Another makes a joke about them being real, and they all scream "SEE!? PROOF!" The disclosure people have a real funny way of furthering their agenda. This video supposedly has pictures from a secret KGB book on UFOs and aliens, leaked after the collapse of the Soviet Union in 1991. Supposedly some of the aliens are not culturally and psychologically ready to interact with other species. They are xenophobic, like so many of us. Some have been visiting since prehistoric times, and some are hostile. space debris, decided to evolve and become us! Oh, but it is! That computer you're using? Alien technology. You have any fluorescent lights in your house? Alien technology. Cell phone? Alien technology including the towers and all the rest of the thingamabobs and doohickeys. Historically, how do you think Marconi, Bell, Edison and the Wright Brothers got their inspiration. Alien technology again. You have obviously not been paying attention. Edit to add Daimler and Ford ... forgot them. Probably others but I can't think of who at the moment. Can't possibly be in Denial. In fact, I'm nowhere near Egypt. But read my posticule, dewd. It's all there.